With Thanksgiving only a couple of days away, America’s grocery stores will soon be flooded with consumers looking to pick up a few last minute ingredients. And while these time-crunched cooks will likely spend a long time waiting in the checkout line, they at least won’t be greeted with a steep bill once they reach the register. 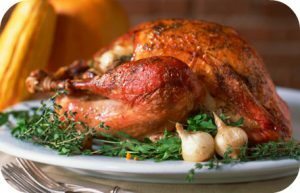 That’s because the American Farm Bureau Federation said that this year’s average price for a Thanksgiving dinner has dropped slightly in comparison to 2017. The most expensive item is the star of the show, the turkey, costing about $21.71 for a 16-pound bird. In fact, turkey prices haven’t been this low since 2014. The cost of sweet potatoes has also dropped this year along with other items like green peas and rolls. Of course, not everybody sticks solely to these classic dishes on Thanksgiving. For instance, those households that add a 4-pound ham and 5-pound bag of Russet potatoes bring their Turkey Day total to an average cost of $61.72. Other families opt for organic and unfrozen ingredients that can push their bills as high as $300. No matter how you choose to celebrate, though, we wish you a happy Thanksgiving and a joyous start to the holiday season. Why did the cost of the average Thanksgiving dinner drop this year in comparison to 2017? Do you think the American Farm Bureau Federation’s study accurately reflects the average cost of a Thanksgiving dinner? Why or why not? Source: Zlati Meyer, “Go Ahead and Gobble Up – the Average Thanksgiving Dinner Costs a Bit Less Than Last Year,” USA Today, November 15, 2018.